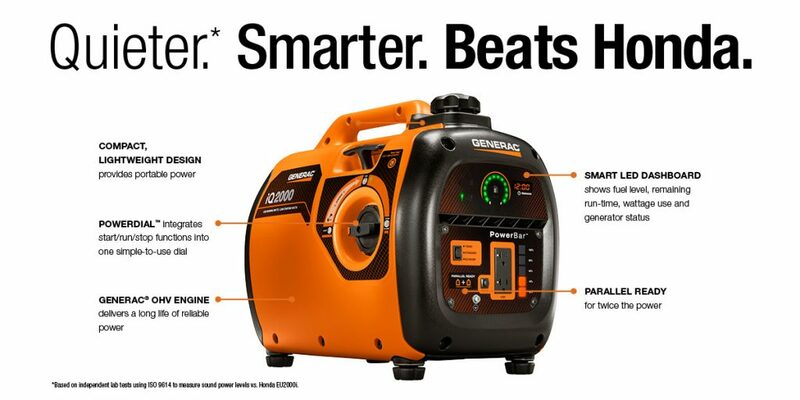 Generac iQ2000: The Quietest Generator EVER! 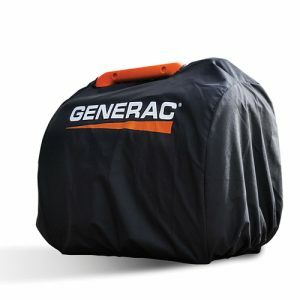 What Makes the Generac iQ2000 Unique? How Easy Is It to Maintain the Generac iQ2000 Inverter Generator? What About Portability or Ease of Carriage? How Fuel Efficient Is the Generac iQ2000 Inverter Generator? What’s the Power Output Rate? How Is Noise Free Generac iQ2000 Inverter Generator? Now if this is your first contact with the Generac iQ2000 inverter Generator you should have several questions at heart. First, what makes the generator any different from the others out there? How efficient, reliable and cost-effective is the Generac iQ2000 inverter generator when compared with other brands? I’m sure you got many more questions running through your minds right now. But why not get on board and let’s explore the Generac iQ2000 Super Quite Inverter generator to see what it’s got! The Generac iQ2000 inverter generator is an alternative source of power meant to bring comfort on the go. Irrespective of where you are or need to be, it’s just the perfect tool for power connectivity. Its structuring is to the point of exceeding some unique features you usually would cherish in even a Yamaha EF2000iSv2 or Honda EU2000i. So, let’s explore the Generac iQ2000 Super Quiet Inverter Generator. Every product or brand is known for one great benefit or the other, and the Generac iQ2000 is no different. It offers an excellent alternative for both indoor and outstation power needs anytime. The Generac provides an excellent source of energy for small power needs. But its efficiency, seamless transmission; no noise benefits seem to be some of the things that stands the generator out when compared to others in the power generation and home appliances category. Several things make the Generac iQ2000 unique as it offers you comfort while leaving you with little or no stress. First, it comes with high aesthetic values so you should be proud owning and showing off one. Second, its a power control features make it both smart and easy to operate under any condition. Thirdly, there is nothing as troubling as having to deal with fumes or noise emission in an event or a location. And so the fact that the Generac 6866 iQ2000 gives pure comfort without noise emission or air pollution within the environment makes it a must-have. If you add the cost of acquiring and maintaining Generac iQ2000, then it leaves no more questions about the efficiency or reliability of the generator. Do you also know that Generac 6866 iQ2000 allows you to regulate your load usage or sharing, that way you can cut down on power consumption and keep it running longer and better with the three mode controls of the generator? When making a purchase decision, it goes beyond just acquiring a new device or gadget. The critical considerations before any purchase should be the overall cost of acquisition as well as running cost. For the Generac iQ2000, it is both cost-effective, low on maintenance cost and is eco-friendly. Generac 6866 iQ2000 combines a hi-tech feature of stable and well-regulated power output, smart LED power control features and more. The provision of information such as the generator status light, run-time remaining, efficient electronic fuel gauge, start, stop and run power functions all combine to make for easy usage of the generator. 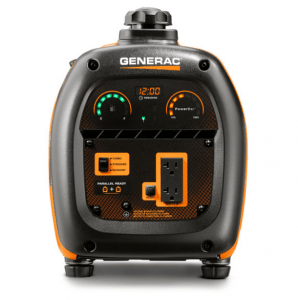 From the moment you bring out the Generac iQ2000 out of the carton you can start using immediately after filling the fuel tank and connecting to a power outlet, it’s that easy to set-up. Understanding the current runtime based on current load makes it easy to plan your event uninterrupted by a power outage. The status light helps prevent the unwanted or unusual occurrence or interruption due to low oil, exceeding generator’s capacity or when the system begins to overheat. With the three control modes, the Generac 6866 iQ2000 makes it possible to reduce noise when using less power demanding gadgets by switching to Economy mode. 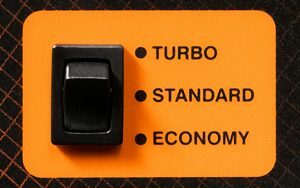 Standard Mode is best for electronic devices that are of moderate capacity while you should switch to Turbo mode when using more large appliances and require full power. The three Mode set up helps ensure your inverter generator lasts longer and remains active for a more extended lifetime. The Generac iQ2000 comes very light, so it’s quite easy to move around. Its feature weight makes carriage by hand possible coupled with the fact that it does not take up much space. With the inverter generator weighing 46.2 pounds, it does not pose any weight risk during carriage, making it the perfect source of power for your small event. What better, lighter and efficient power source could you wish for than the Generac 6866 iQ2000 super quiet inverter generator for your camping events, tailgating parties, job sites, outdoor, recreational or even household events? It’s an excellent 4-in-1 offer; smart, light, quiet and efficient inverter power generator. Efficient isn’t complete until it can guarantee a predictable gasoline consumption level. As for the Generac 6866 iQ2000, fuel consumption could be regulated based on power load and usage making it more cost-effective. With the Generac generator the smaller the electricity load the lesser the fuel consumption. Generac iQ2000 comes with a maximum power output capacity of 2000 watts but 1,600 watts when on continuous operations. It uses 1,600 watts while running but requires the extra 400 watts to aid the starting of appliances with more wattage needs. Massive machines like a refrigeration unit usually require more power when starting but would drop out the extra once it normalises. Meaning the total power consumption cumulatively for all electrical gadgets you can connect should not exceed 1600 watts. The implication is that you should not connect multiple weighty power consuming appliances on the generator. One large device and other small electronics are just perfect to keep the Generac iQ2000 working efficiently without overloading. The Generac 6866 iQ2000 works by converting the raw power it generates from direct current to alternate current through the aid of the in-built digital module inverter. 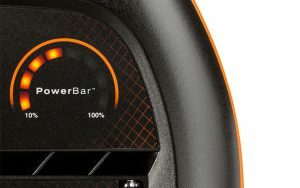 The power bar helps in knowing current power consumption to regulate usage. The Power Dial Start, Run and Stop function supports ease of operations. When assessed with to other generators in its class the Generac iQ2000 could be termed noise-free or super quiet. The more load inclusion on the unit will increase the sound output and vice versa but still not as loud when compared with others in its league. The implication for any user of the Generac 6866 iQ2000 is a noise-free environment for you, your friends, loved ones and neighbours. 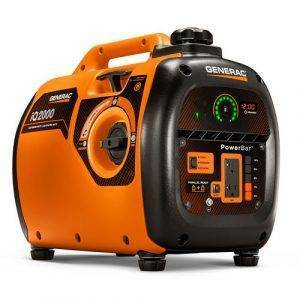 Considering the unique features and several other benefits the Generac iQ2000 Super Quiet Inverter Generator holds I dare so it is an inexpensive and moderate price. Interested buyers have the option of purchasing a used Generac 6866 iQ2000 generator at a cheaper rate, make full payment as at purchase time or choose 12-month payment plan as a financing option. We recommend to buy it directly from amazon. Each purchase comes with a three year residential and commercial life warranty.